Quarter 1 parent teacher conferences are officially over! At KIPP we conference as a full teaching team, so the fifth grade team has spent fifteen hours together over the past three days… and it was fun! We met with lots of happy parents (a testament to the strength of the team), shared some good laughs and ate lots of food! Last year we started the tradition of having a conference week potluck. As a result, we’ve eaten very well, enjoying Karen’s apple crumble and pasta salad, Julie’s black bean enchiladas and salted caramel cupcakes, Arlena’s chili and sweet cornbread, Alaina’s fluffy fruit dip and decadent chocolate pie, and Ashley’s baked pasta and famous crumble. Tuesday I tried a pinterest cheesy tomato quinoa bake. Meh, it’s not worth blogging. Today I decided to make my new favorite Brussels sprouts dish. I’ve made it three times in the past two weeks! I love roasting Brussels sprouts because of the way they get soft on the inside and are crunchy on the outside. The dried cherries and pecans add sweetness and texture. The gorgonzola topped at the end is the icing on the cake, and really brings the entire dish together. I’ll be making this dish for school thanksgiving and LA friendsgiving. It’s become a quick hit! 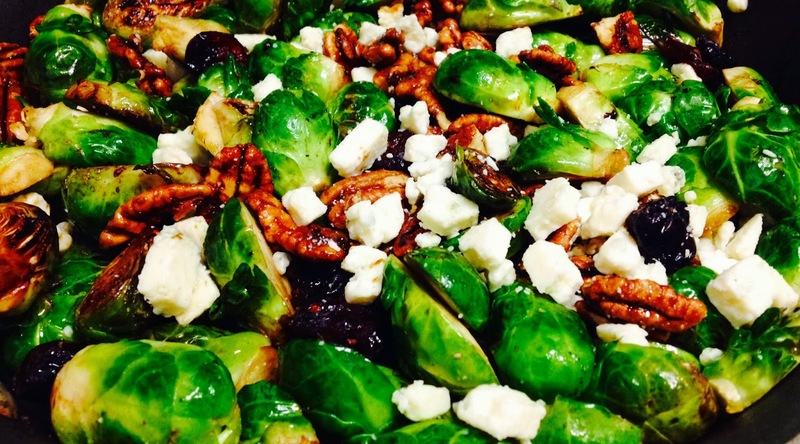 Heat oven to 400° F. On a baking sheet, toss the Brussels sprouts, pecans, cherries, oil, balsamic, salt and pepper. Turn the Brussels sprouts cut-side down (this will give them a nice crunch). Roast until golden and tender, about 25 minutes. Top with gorgonzola and serve.